This is not my new nickname. Just putting that out there immediately. Christmas creep is that friendly reminder that you should be buying your Christmas gifts now. It’s hearing “Jingle Bells” on your favorite country station before the leaves have even turned. 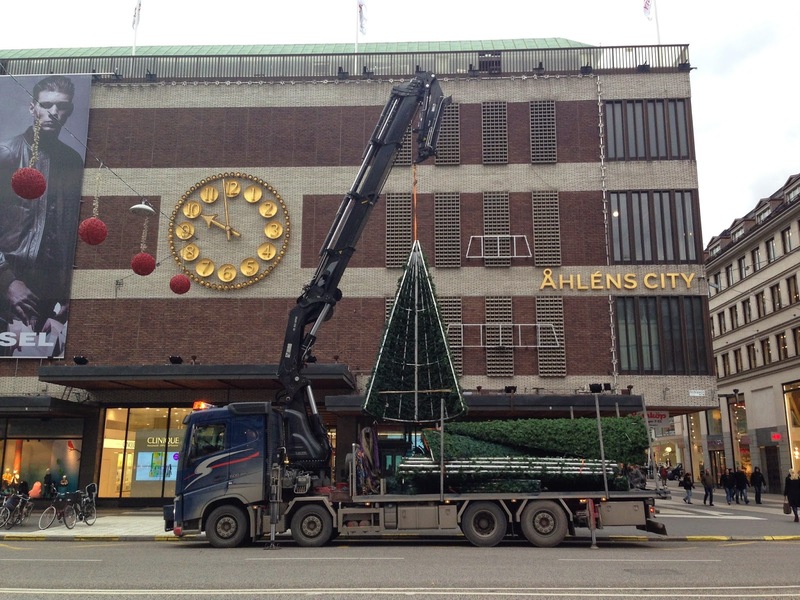 It might even be seeing Christmas decorations being mounted across Stockholm. In October. I first noticed it last Thursday. That’s October 16, 2014. Or, as I like to call it: The day from which there are only 69 days left until Christmas!1 I admit that the name may need some work. Maybe it was just Stockholm trying to get ahead of the game. It must take a while to decorate an entire city and it is getting colder and darker. Maybe the city was just taking advantage of daylight and better weather. Maybe. But then a few days later there were Christmas decorations in store windows. And tomtar and pepparkakor to be bought.2 And today, Christmas trees were being hung on the buildings with care. Now Åhléns is all dressed up with nowhere to go for two whole months. Turns out tomtar are not responsible for Christmas decorations. The nice thing about Christmas creep are the lights. Stockholm is getting dark and daylight savings means we’re falling back an hour in just a few days. Any light helps. Of course, the downside is that now everyone (ALL OF THE PEOPLE!) will be inundated with Christmas suggestions. Which is probably annoying for the folks who don’t celebrate. And also annoying for me. And clearly I should be catered to at all times. Especially since everyone knows that the best time to buy Christmas gifts is the day before Christmas. Duh. Welcome to Sweden. And 62 days until Christmas. No kidding. Really. I always buy my Christmas gifts on Dec 24th. I call up everyone I really care about or those to whom I really have to have a gift for later in the night, and ask them: "what do you want for Christmas? Is there anything you need or you're dreaming of?". Mind you, those "dreams" must be within a very tight budget range. Still, it works!!! I do not stress the whole 69 days before Christmas (yepp, though - amazingly so - I have not yet seen any Christmas decorations around town or shops this year, they also start in October here in Brazil. With all the Christmas trees and snow that we DO NOT HAVE IN REAL LIFE. But Christmas is not about real life. Is it? ), I determine a maximum amount of money to spend on each gift (the only one out of that range is my mum's) and I get very focused by what the person told me he/she wants and what is still available (or still left, if you wish) in the stores. It works as a charm. I think you nailed it... Christmas is not about real life. At all.